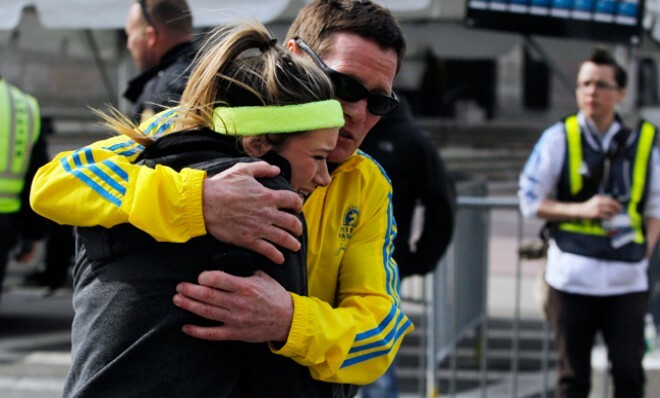 Any right-minded person will struggle to take in the events of last night’s bombings in Boston. Ordinary folk, after months of preparation, take to the streets of an unassuming American city to run a marathon, like thousands before them yet are subjected to unimaginable violence and barbarity that defies all sense of reason. Poignantly, there were sure to be runners raising funds for charities, some equivalent to our home-grown Help For Heroes. Those brave army personnel who risked their lives for the freedoms we enjoy every single day. In the line of duty, they lost limbs and suffered other appalling injuries, many from bombs as, sadly, will many in the aftermath of Boston. Witnessing the 2 bombings as we did on television, set just 10 seconds apart to clearly inflict maximum devastation, seeing men, women and children, literally fleeing for their lives was heart-breaking. Seeing people distressed, covered in blood and shaking from shock and others being carted off on stretchers was almost too much to bear. Then we heard the first victim was an 8 year old boy and the horrific realisation of the human cost brings to mind the idiom, There For The Grace of G-d Go I. A son, perhaps a brother, nephew or grandson who went along to an event enjoyed the world over and ended up broken in a wooden box. Who dares say sports is nothing to do with politics. From Bahrain to Boston, politics, whether home-grown or from far off lands, affects each and every one of us and no amount of postulating can deny this truth. In South Africa, international cricket was banned between 1982 and 1990 because of the apartheid regime. Quite rightly, governments and sports governing bodies were not willing to accept the brutal division of blacks and whites. In Bahrain currently, it is reported that security officials are rounding up rebel groups in the near vicinity of the F1 track. Understandably, we cannot fight all the ills of the world but by attending the race, are we not condoning the suppression of fellow humans’ suffering. Wherever we live and however we live, every aspect of civilian life is dominated by world events and it is up to us, the ordinary person, be it teacher, lawyer, nurse or athlete to stand up for what we believe in. It’s ironic that Margaret Thatcher who is being buried tomorrow, refused to cow tail to terrorists; nicknamed the Iron Lady by the Russians when negotiating communism behind the Iron Curtain she ended up instrumental in its downfall. She was very nearly killed when the IRA bombed the Conservative Party conference in Blackpool yet, in the immediate aftermath, refused not to continue with it. Her inflexible mindset, although ultimately detrimental, was instrumental in achieving peace in Northern Ireland. That’s why, if you were intending to run the London Marathon on Sunday, you should pull on your tank top, lace up your shoes, fill your bottle with water and run because you can. Job Prospects for Disabled People: Are they at a disadvantage?